Today’s article is about an old and dead collectible card game resurrected as a living card game. Legend of the Five Rings (L5R) was first published in 1995 by Alderac Entertainment Group and continued until 2015, giving Magic: the Gathering a run for its money as longest published CCG. AEG then sold the rights to Fantasy Flight Games who is publishing a new version that is incompatible with the AEG version. 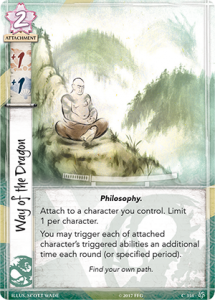 L5R is heavily influenced by Asian cultures, predominately Japan, and takes place in the magical world of Rokugan. You will find samurai, ninjas, monks, shugenja (elemental wizards), court politicians, emperors, and yojimbo. 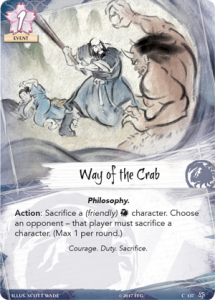 L5R has always been very story driven, and was unique in that the players get to influence the story line directly. This was usually through doing well at tournaments, but during the time I played there were rewards for best decorated game store, best cosplay, most clan t-shirts at the equivalent of a Grand Prix, and many more I don’t recall. The end results of all of these was determining the next emperor and it was an insanely close race. Perhaps unfortunately FFG has decided to give the 20 years of lore the Star Wars treatment and started the story back at the beginning, though this does give them freedom to take it where they want without being bound by traditions and sacred cows from AEG. If you want, you can find all the previous short stories here under AEG CCG Story, but be warned there is a ton to read. So today I wanted to introduce you to the clans we will be seeing in the new game, as well as some basic rules information. FFG is giving us a slow drip of rules and card spoilers so I will only discuss four clans today in any sort of depth but will introduce all seven (yes, only seven are in the base game as of now, sorry Mantis, Spider, Ratling, Shadowlands etc players). Before I can talk about the clans though there are some gameplay elements to discuss. First, there are three methods to victory in the new version, breaking, honor, and dishonor. Breaking victories consists of breaking your opponents provinces and stronghold, most similar to attacking life total in MtG, provinces can be broken by military or political attacks. Each character will have both a military and political strength stat and conflicts of either type can be declared. Honor victories comes from raising your honor from its starting value (around 11 from what we have seen so far) up to 25 and you lose if your honor falls to 0. Honor is traded with your opponents whenever you bid for card draw or duels. Each player secretly bids on how many card they want to draw for the turn and whomever bids higher loses the difference in honor and the lower bidder gains that much honor. You also lose 5 honor if you deck yourself but you get to reshuffle your discard back into your deck. So when I say a clan is “military focused” or “dishonor focused” you are not lost as to how they want to win. The seven clans in alphabetical (and, luckily, spoiled up to now in roughly this order) are Crab, Crane, Dragon, Lion, Phoenix, Scorpion, and Unicorn. This new quiz can help you identify which clan might appeal the most to you. You’ll have to make a copy in google sheets or download and fill it out in excel. I’ll try to outline the clan strategies and play style as best I can. The Crab clan are the defenders of the Kaiu Wall on the southern border separating the Emerald Empire from the horrors of the Shadowlands. They are mighty warriors and builders, boasting some of the h ighest military stats spoiled so far. The Crab clan excels at defense, often receiving bonuses that victorious attackers would get when the Crab wins a defense. They are also used to sacrificing themselves to protect the wall, which translate in-game to trading weaker characters for a larger gain, such as directly destroying opposing characters, boosting other Crabs, or drawing cards. 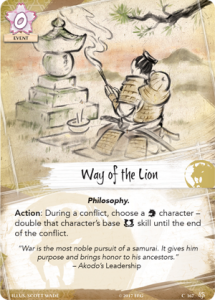 They also have a strong dishonor theme, such as punishing opponents for not attacking, or punishing the opponent for playing cards in combat. You might enjoy this style if you like MtG decks like Aristocrats or a Commander like Savra, Queen of the Golgari. The Crane clan are masters of the court, and rather than using brute force to destroy their opponents use their political might to bring honor to their clan, but when words fail they are among the best duelists. 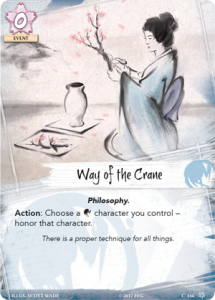 Crane’s have the highest political stats we have seen so far and have many ways of interacting with your opponents characters. Their raw political strength should be enough to win by breaking provinces but they also have an efficient control suite to help control the board. This combination of efficient attackers and control elements makes me thing a good MtG analog would be a tempo deck like Delver or for Commander a heavily political deck like Edric, Spymaster of Trest. The Dragon clan lives a secluded life in the mountains in the North of Rokugan. They seek enlightenment and avoid attachment to the physical world. So it is ironic that they have a focus on attachments, like equipment or auras from MtG. They will usually invest many resources into one powerful character that will stick around for a while and is more flexible than the straight political strength of the Crane or physical might of the Crab. They also have a resource manipulation theme, both in adding fate to themselves or removing it from opponent’s characters. Simply put, fate is like fading from MtG, when you summon a character you can over-invest in them to add fate counters which are removed every turn before your character goes away. My next article will cover a lot more of the rules and playing the game while we wait for more spoilers for the other clans. If your favorite commander ever was Uril, the Miststalker the Dragon clan might be right for you. The final clan to get a good look at is the Lion Clan. The Lion clan is the backbone of the Emerald Empire’s military and has the largest standing army. They strongly follow the codes of Bushido and honor is very important to them. 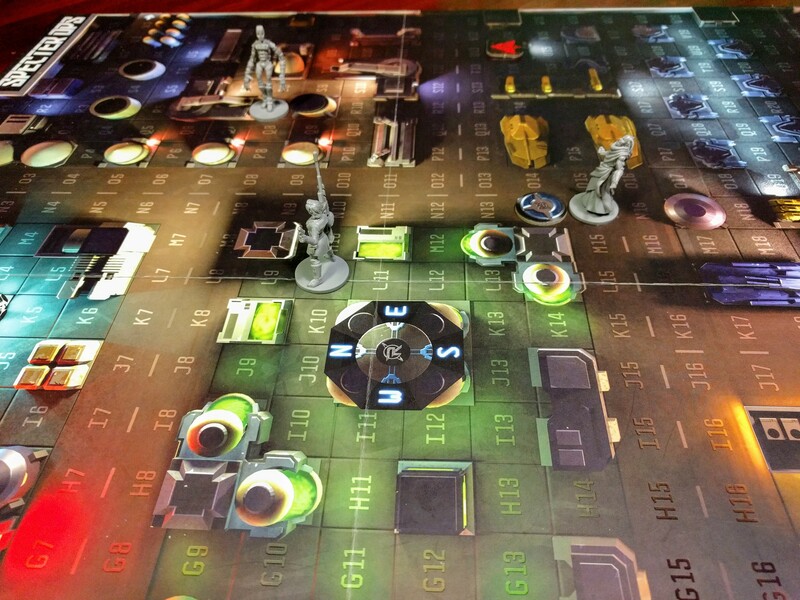 They are looking to swarm the board with cost effective characters and go for quick military breaks. The Lion clan has the ability to purchase more characters than other clans and has tricks up their sleeve to allow them to stick around longer than they should. If you like token decks this clan might be a good fit for you. We haven’t seen much yet for the remaining three clans but I can give a brief overview. The Pheonix clan are where the majority of the shugenja study, and are a pacifistic clan. From the spoiled cards we know they have a pacifism effect called…pacifism…and that shugenja can impact a conflict while not participating. The Scorpion clan is the underhanded and sometimes dishonorable “dark” opposite of the Crane clan, they work in secret to achieve political ends for the greater good of the Emerald Empire. The spoiled cards show manipulation of the bidding process, and a strong dishonor theme. The Unicorn clan left the Empire for 800 years and explored the surrounding lands. When they returned they were greeted as invaders and were only “allowed” to rejoin the empire after carving out their lands and soundly defeating the defenders. The Unicorn resemble the Mongolian horde with their focus on strange weapons and horses. Their calvary allows them to harry their foes or disengage from unprofitable combat. Part two of this article will discuss the remaining three clans a little bit more in depth but unless FFG starts giving more to us it will be very close to release before I can tell you more. In the mean time I’ll get an article about gameplay, card break down, and what rules we know. Aaron has been playing games since the early 90s starting with the Sega Genesis and Chess. These days Aaron has left the console wars behind and prefers games with more varied replayability. He started playing Magic: the Gathering in 2002 with Onslaught and became more competative during Shards of Alara in 2008. 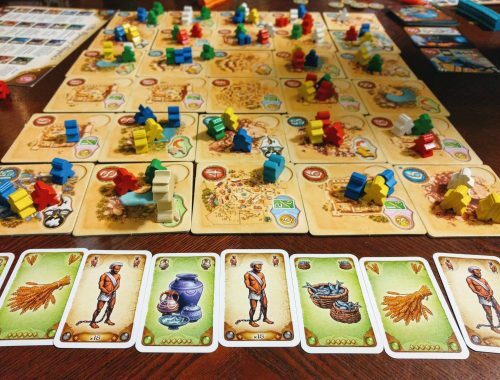 His current favorite board games are Kingdom Builder and Seasons.